The motivation for this work is to develop a guided wave system to inspect a large area of a thick (5-25 mm) plate structure from a single test position. The immediate application area is in the testing of the floors and walls of steel storage tanks in the petrochemical industry. In order to test the floor of a tank, the tank must be emptied and cleaned. The advantage of using a large area testing system is to reduce the inspection time and therefore to reduce the amount of time for which the tank has to be out of service. A further application for which the proposed inspection system could prove advantageous is in the testing of structures clad with insulating material such as rockwool. In such cases the cladding only needs to be removed at the test location, as the use of guided waves permits the inspection of the surrounding structure beneath the cladding. 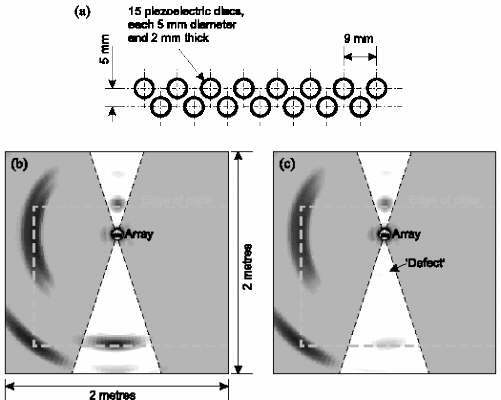 One approach to inspecting plates using guided ultrasonic waves, is to design a transduction system that uses monolithic devices such as wedge transducers, inter-digital transducers or meander coil electro-magnetic acoustic transducers (EMATs). Unfortunately, in order to achieve a given level of performance at a particular operating point on the dispersion curves, the physical dimensions of a monolithic transducer must be scaled in proportional to the thickness of plate under inspection. This renders the use of monolithic devices on thicker plates increasingly impractical for several reasons, not least because of the cost and difficulties involved in manufacturing large devices. Also, particular monolithic devices are limited to a small range of applications since they are generally designed to be sensitive to a particular wavelength and to be either unfocused or have a fixed focal length. A more attractive solution is to use an array device containing a number of elements that behave individually as point transducers. By controlling the elements individually, wavelength selection, beam steering and focusing can all be performed by post processing the same set of test data. This paper presents predicted and experimental results obtained from various different array geometries. The majority of the fundamental theoretical work on Lamb waves assumes a plain strain system . This means that waves can only travel in one of two directions and that the wavevectors of the Lamb waves are only one-dimensional. Although considerable work has been performed on, for example, pure mode excitation  this has mostly been confined to the idealised one-dimensional case and the extension to more practical two-dimensional cases has been limited. Unfortunately the wavevectors of Lamb waves in a real plate are two-dimensional as waves can propagate in an infinite number of directions. In a carefully set up laboratory experiment where the location of structural features (i.e. plate edges, defects etc.) can be controlled, it is possible to simulate one-dimensional propagation. However, in a practical application where there is no a priori knowledge of the location of structural features, the fact that waves can be reflected off features in any direction becomes very important. As will be demonstrated, the need to achieve directionality in two-dimensions is at least as complex as achieving mode purity in this type of inspection task. The structures in the intended application area have two salient attributes as far as the selection of suitable guided wave modes is concerned. Firstly, the structures are thick, hence the usual operating points on the fundamental guided modes (A0, S0 and SHo) occur at low frequencies and have large wavelengths. Because of the large wavelength the overall size of a transduction device must also be reasonably large (with typical dimensions in the order of 200-300 mm), in order to obtain some degree of directionality. As has been shown previously , the transducer size will not be reduced if higher order modes are used since greater modal selectivity will be required. This means that the transducer dimensions will have to span a greater number of wavelengths, although the wavelength of these higher order modes may be shorter. Therefore it has been decided to use one of the fundamental modes. The second structural attribute governing the selection of a suitable mode is the level of guided wave attenuation due to leakage into the surrounding media if these are non-gaseous. This will be the case during the external inspection of the walls of a liquid filled tank, and it may also be the case when testing the floors and walls of a nominally empty tank which still contains sludge deposits. Hence for maximum flexibility it is desirable to use a mode which exhibits low leakage attenuation into surrounding liquids. This precludes the use of the A0 mode in practical applications, although it is used for concept demonstration by two of the prototype devices described here. Conventional methods of exciting and detecting guided waves include the angle incidence technique [1,4], inter-digital transducers (IDTs) [5,6] and EMATs . It has been shown previously  that the angle-incidence technique is not suitable for use with modes with low attenuation due to leakage, and hence they would be unsuitable for this application. With suitable material and geometry, IDTs and EMATs can both potentially be used to excite and detect low attenuation modes. However, the size of transducer required means that the construction of a monolithic device (i.e. an IDT made from strips of piezoelectric material or a single meander coil EMAT) would be difficult and expensive. Furthermore it would be almost impossible to obtain adequate coupling between an IDT made of rigid strips of a material such as PZT and the surface of a real structure. This problem of coupling to a non-flat surface could potentially be solved by using lines of small, individually sprung-loaded piezoelectric elements wired in parallel rather than single strips. It is from this concept that the idea of an array device arose. An array device also consists of a number of small elements, which individually behave as point sources. However in an array device the elements are operated individually, rather than being hard-wired together. To obtain results from an array device, the data obtained from operating the elements individually is recombined either electronically or in processing software. The advantage of this is flexibility. A monolithic device is tuned to a particular wavelength, 'looks' in a single direction and is either unfocused or focused at a fixed distance, but in an array device all these attributes can be varied by re-processing the data. In practice, this means that an array device can be placed on a structure and can then effectively look at the surrounding structure in all directions, without the device having to be physically moved. Once a transducer array has been positioned on the structure under inspection, the first stage of array operation is the acquisition of raw data. The raw data consists of a number of time-traces which correspond to all the possible permutations of elements in the array acting as transmitters and receivers, including the cases where the same element acts as. both transmitter and receiver (i.e. pulse-echo signals). This would suggest that from an array containing n elements, it would be necessary to collect n2 time-traces. The number of independent time-traces is almost half this, since although one pair of separate elements yields two separate time-traces depending on which one is the transmitter, these time-traces are actually identical due to reciprocity . In fact, for an array containing n elements, there will be n(n+1)/2 independent time-traces, n of which come from each element in the array being operated individually in pulse-echo mode and n(n-1)/2 of which come from pairs of elements in the array being operated in pitch-catch mode. It should be noted that the same excitation signal is used in all cases, and this is usually a multi-cycle windowed toneburst in order to limit the bandwidth of excitation. It is also very important that the time origin in each time-trace is constant with respect to the time of the excitation signal. It is usual to set the time origin to be at the centre of the excitation signal. The next stage is to process the raw data in the time traces into useful data that relates to the location of reflectors in the structure under inspection. Currently this is achieved using what will be referred to as the addition algorithm. The addition algorithm is a means of phase shifting and summing the data in the raw time-traces to enable the array to look at the surrounding structure in different directions using a single mode. The outputs from the addition algorithm are numbers called field values which measure the amount of the chosen mode which is reflected from different points on the structure. Field values are typically evaluated in either a rectangular or a polar grid around the array and are then displayed on a greyscale map. In order to understand how the addition algorithm works it is instructive to introduce the concept of a virtual device. The virtual device can be thought of as a conventional guided wave transducer (such as an inter-digital transducer) which occupies the same overall area as the physical array. The virtual device can be tuned to a range of wavelengths, rotated in different directions and focused at varying distances. The addition algorithm is a means of manipulating the data in the raw time-traces to synthesise the time-trace that would be received from a particular virtual device operated in pulse-echo mode. Hence the procedure to calculate the field value at a point P on the plate is as follows. First a virtual device is created which is focused on P and tuned to the wavelength of the desired mode. Secondly the time-trace that would be received from this virtual device operating in pulse-echo mode is synthesised using the addition algorithm. Finally, the field value at the point P is found by calculating the amplitude of the envelope of the synthesised time-trace at the time corresponding to a reflection of the desired mode from P. The actual implementation of the addition algorithm is considerably more efficient than this written description implies, although the net results are identical. Furthermore, the data processing can be made almost an order of magnitude faster if the focusing attribute of the virtual device is neglected. Unfortunately the mathematical description of both the addition algorithm and this improvement is beyond the scope of this paper. In principle, the presentation of the results should involve nothing more than plotting the amplitude of the field values on a greyscale plot as a function of position. It is in fact slightly more subtle than this due to the fact that the virtual devices created by the addition algorithm are subject to the same limitations as physical devices. Most importantly, the virtual device can never look in a single direction, but must always look over a range of directions. A typical virtual device will have a field consisting of a main lobe centred on the direction in which the device is looking which is surrounded by a number of smaller side lobes of diminishing amplitude. Although the field can be tailored by various weighting schemes and the sidelobes suppressed, they can never be eliminated completely. These sidelobes are very important, since they determine the maximum signal to coherent noise ratio which can be obtained from an array. Below the coherent noise level, signals start to appear in the processed data which do not correspond to real features but which are aliases of other signals due to sidelobes. In a test on a structure about which there is no a priori information, these spurious signals may be mistaken for defects, when in fact they are merely artefacts of the signal processing. This means that the dynamic range over which the data should be plotted must be carefully limited in order to avoid displaying misleading coherent noise. In order to do this, a reference amplitude is required, and this is taken as being the amplitude of field values produced at a straight, square cut edge of a plate. In order to be able to see typical defects, it is thought that a coherent noise level at least 35-40 dB below this reference level would be desirable. In theory all the experimental prototypes discussed here should be able to achieve a noise level of around 40 dB below the reference, but the most which has so far been achieved in practice is 32 dB. The current experimental configuration is shown in Fig. 1. It should be stressed that this is purely a laboratory set-up at present and is by no means optimised for rapid data acquisition. Once the array is positioned at a test location, the data acquisition procedure is in two parts. In the first part the n pulse-echo time-traces are acquired. The excitation signal, which is usually a 5 or 10 cycle Hanning windowed toneburst, is created using a Wavemaker H (custom made by Macro Design, UK) which is a combined signal generator, power amplifier and pulse-echo unit, specifically designed for Lamb wave testing. A computer controlled switching device is used to route the pulse-echo output from this device to any one of the transducer elements in the array. The received signal from the transducer element passes back through an internal low-noise pre- amplifier in the Wavemaker II and is fed to a digital storage oscilloscope (LeCroy 9400). Here the signal is digitised and fed via a GPIB link to a computer where it is stored. The process of switching to each of the transducers and capturing the data is automatic. The second part of the acquisition stage is to capture the n(n-1)/2 pitch-catch time traces. For this part, the Wavemaker II is switched to operate in pitch-catch mode. Again the outgoing signal is routed to one of the transducer elements in the array using the computer controlled switching unit. This time however, the received signal comes from a different element, hence a second computer controlled switch is used to route the signal from the chosen non-transmitting element back to the pitch-catch input on the Wavemaker II. Once again the received signal passes via an internal pre-amplifier to a digital storage oscilloscope and finally to a computer for storage. This stage of the acquisition is also fully automatic. Using this experimental configuration, the raw data from a 16 element array (comprising 136 time-traces) can be acquired and stored in 40-60 seconds. All the tests described here were carried out on the same sample, a 5mm thick aluminium plate measuring 1.25 m by 2.5 m.
It has already been noted that the A0 mode is not suitable for practical applications. However, in order for the addition algorithm to be used, it is necessary that the elements in an array behave as point sources and generate axi-symmetric fields. In the case of the A0 mode,this can be very easily achieved with discs of PZT placed directly on the surface of the structure under test. as shown in Fig.2(a). In order for the discs to behave as point sources, their diameter needs to be small compared to the wavelength of the mode which is to be used. The first prototype described below uses such PZT discs as the transducer elements and is intended to illustrate the principles of array operation, and the type of results which can be obtained. PZT discs effectively apply a point force normal to the surface of the plate (out-of-plane) when transmitting and detect out-of-plane surface displacements when receiving. It is for this reason that they efficiently excite and detect the A0 mode which has a large amount of out-of-plane surface displacement associated with it. Unfortunately a satisfactory axi-symmetric point source capable of exciting and detecting a low attenuation mode is still under development. Such a device effectively needs to be able to apply an axi-synimetric field of in-plane surface traction to the structure. A possibility which has been investigated is to use elements which although not fully axi-symmetric, do provide a fairly uniform field of the low-attenuation SH0 mode over a limited range of angles, as shown in Fig. 2(b). Results obtained from such an array are given in the following section, together with results from an PZT disc array using the A0 mode with the same element geometry for comparison. This circular array demonstrates the type of wide area coverage which can be achieved using this technology. To suit existing equipment, the array only has 16 elements as shown in Fig. 3(a) and operates with the A0 mode at 50 kHz (0.25 MHz mm), where the wavelength is 28 mm. It can be shown that there is a maximum acceptable spacing between elements in the array that is approximately 40 % of the shortest wavelength of all the modes present. Because of this and the fact that there are only 16 elements in the array, the ratio of the overall diameter of the array (28 mm) to the A0 wavelength at 50 kHz is 1:1. This is somewhat low, and means that the angular resolution of the array is fairly poor as shown by the graph in Fig. 3(b). A larger diameter array containing more transducers would have superior resolution (i.e. the width of the main lobe on the angular resolution graph would be reduced), but at the expense of increased data acquisition and processing time. 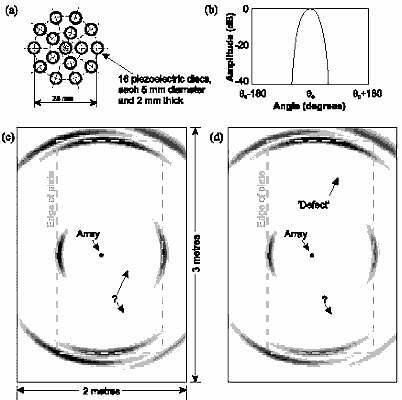 Fig 3: (a) Geometry of cicular array using A0;(b) the predicted angular resolution spectrum; (c) results from a defect free plate and (d) results from a plate with a simulated defect. In both (c) and (d) the greyscale range is 30 dB from white to black. The defect was simulated by bonding a 25 mm diameter steel bar to the plate. The question marks indicate signals which do not correspond to known physical features. The results obtained when this circular array was used on the aluminium test plate are shown in Fig. 3(c). The boundaries of the plate are indicatcd on the plot by the grey dotted line. Field values have been computed outside the boundary of the plate to highlight the signals which correspond to the corners of the plate. Signals from the edges of the plate can also be readily identified. The smearing of all these signals into circular arcs is expected and is in reasonable agreement with the angular resolution graph shown in Fig. 3(b). With the exception of two unidentified smaller signals within the area of the plate, the array appears to be achieving a 30 dB signal to coherent noise level. The origin of these unidentified signals is not known, but may result from inconsistent coupling between the elements in the array. In Fig. 3(d), a 25 mm diameter steel bar has been bonded to the plate using Superglue, to simulate a localised defect. It can be seen that this produces a clear signal at about -23 dB below the level of signals from the plate edges. An interesting statistic arising from these tests is the ratio of the area of the plate inspected to the area of the transducer array which in this case is 3000:1. This gives an approximate indication of how much more efficient a large area testing system is to a point by point testing strategy. The next array to be considered again uses PZT disc elements and operates with the A0 mode this time at a frequency of 77 kHz. From the geometry shown in Fig. 4(a), it can be seen that this is a linear array rather than a circular array. This array was built as a prototype for the array considered in the following subsection which uses shear piezoelectric transducer elements. These linear arrays can only look at the surrounding structure over a limited range of angles, referred to as the 'field of vision', and not in all directions. For this array, the field of vision is two, 360 wide sectors on either side of it. Field values can be calculated outside the field of vision, but when the array is looking into these areas many sidelobes are present and hence signals may appear which do not correspond to physical features. Results from this array are shown in Fig. 4(b) and (c). In the case of Fig. 4(c), a defect has again been simulated this time by coupling a 100 mm diameter steel disk to the plate with ultrasonic couplant gel. Although this is a large feature and significantly attenuates the waves passing underneath it, it only produces a very small reflection. This signal is clearly visible in Fig. 4(c) at a level of about 28 dB below the signal from the plate edges. It is also interesting to observe the significant reduction in amplitude of the signal from the edge behind the defect which is due to the attenuation caused by the defect. Fig 4: (a) Geometry of linear array using A0 mode, (b) results on a defect free plate and (c) results from a plate with a simulated defect. The grey areas in (b) and (c) indicate regions outside the field of vision of the array. The final array considered is a linear array which has the geometry shown in Fig. 5(a).It can be seen that this is a scaled up version of the geometry of the previous device. Rather than piezoelectric discs, this array uses shear piezoelectric devices (supplied by Alltran, UK) which have been used previously for the long range inspection of pipes . These devices produce non-axi-symmetric fields as shown in Fig. 2(b). These are aligned in the array such that the SH0 mode is generated in a direction perpendicular to the rows of transducers and the device was operated at 50 kHz. The SH0 field produced by these devices has been measured using a laser interferometer and found to be reasonably uniform over two 800 wide sectors on either side of the transducers. It was therefore assumed that over the 360 wide field of vision, the transducers would perform satisfactorily. 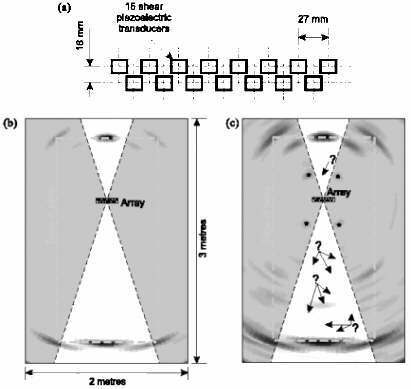 Fig 5: (a) Geometry of linear array using SH0 mode, (b) results from a defect free plate with a greyscale range of] 7 dB from black to white and (c) the same results but on a 30 dB scale. The question marks indicate signals which do not correspond to physical features and the asterisks indicate S0 mode signals. The grey areas in (b) and (c) indicate regions outside the field of vision of the array. In the results shown in Fig. 5(b), the signals corresponding to the edges and corners of plate within the field of vision can be readily identified. As expected, there are no signals in the main area of the plate, as there are physically no reflectors present. However, the scale on this plot is only 17 dB, and too small to be useful in a practical application. If the scale is increased to 30 dB, as in Fig. 5(c),a significant amount of coherent noise appears in the main area of the plate. From this point of view, the performance of this array is clearly poorer than the other two arrays which have been described. It is thought that the reason for this poor performance is due to the other modes (namely A0 and S0) which the transducer elements generate at right angles to the primary SH0 generation direction. For example, the four signals indicated with asterisks are strong evidence of significant S0 generation, since they are too close to the array to be reflections of either SH0 or A0 from even the nearest plate edge. They must therefore be due to waves propagating as S0 which is much faster than the other modes. The feasibility of using guided wave arrays to inspect large areas of thick structures has been demonstrated experimentally with two devices using the A0 mode. The operation of a device using a low-attenuation mode (SH0) has been demonstrated although the signal to coherent noise level is poor. The next stage of this work is to develop more suitable transducer elements to excite and detect low-attenuation modes and which have axi-symmetric fields. At present, EMATs and special PZT devices are undergoing preliminary testing. I. A. Viktorov, Rayleigh and Lamb waves: Physical theory and applications, (Plenum Press, New York, 1967). D. N. Alleyne and P. Cawley, NDT and E International, (1992), Vol. 25, p. 11. P. D. Wilcox, P.Cawley, M. J. S. Lowe, in Review of Progress in Quantitative NDE, Vol. 18A, eds. D. 0. Thompson and D.E. Chimenti (Plenum Press, New York, 1999), p. 151. X. Jia, J. Acoust. Soc. Am., Vol. 101, (1996), p. 834. J. Ditri, J. Rose, and A. Pilarski, in Review of Progress in Quantitative NDE, Vol. 12A, eds. D. 0. Thompson and D. E. Chimenti (Plenum Press, New York, 1993), p. 211. R. S. C. Monkhouse, P. D. Wilcox, and P. Cawley, Ultrasonics, Vol. 35, (1997), p. 489. G. A. Alers and L. R. Burns, Materials Eval, Vol.45, (1987), p. 1184. B. A. Auld, Acoustic Fields and Waves in Solids, (Krieger Publishing Company, Florida, 1990). D. N. Alleyne, P. Cawley, A. M. Lank, and P. J. Mudge, in Review of Progress in Quantitative NDE, Vol. 16B, eds. D. 0. Thompson and D. E. Chimenti (Plenum Press, New York, 1996), p. 1269.